I can't seem to go long with out craving some sort of pumpkin dessert. There is something so comforting and warming about anything pumpkin (except pumpkin pie which I oddly don't like.) Pumpkins are also very good for you, high in beta and alpha carotene, which help keep your immune system healthy by acting as an anti-inflammatory. Pumpkins are high in fiber and rich in potassium as well as Vitamin C, E and Iron. Now of course when I incorporate butter and sugar along with it I lose some of these nutritional benefits but I feel I am being nutrition neutral and not subtractive. 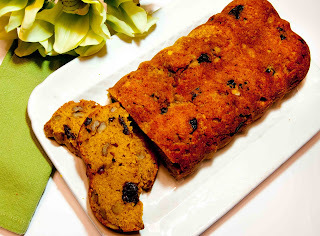 Using pumpkin in desserts is also a good way to use up the left over pumpkin that has been sitting in my refrigerator. One of my favorite things to make with the pumpkin is a quick loaf, add in some dried fruit and nuts for crunch and you have your self a wonderful snack. I recently came across a recipe for a pumpkin and cornmeal cake that looked quite interesting, tweaked a few things and viola. 1) Preheat oven to 350F. Spray 9inch loaf pan with cooking spray or brush with butter. With your stand or hand mixer beat butter and sugar until well creamed. Add the eggs and egg yolks, one at a time, beating well. Scrape down the sides if needed to incorporate. Beat in the pumpkin and vanilla. 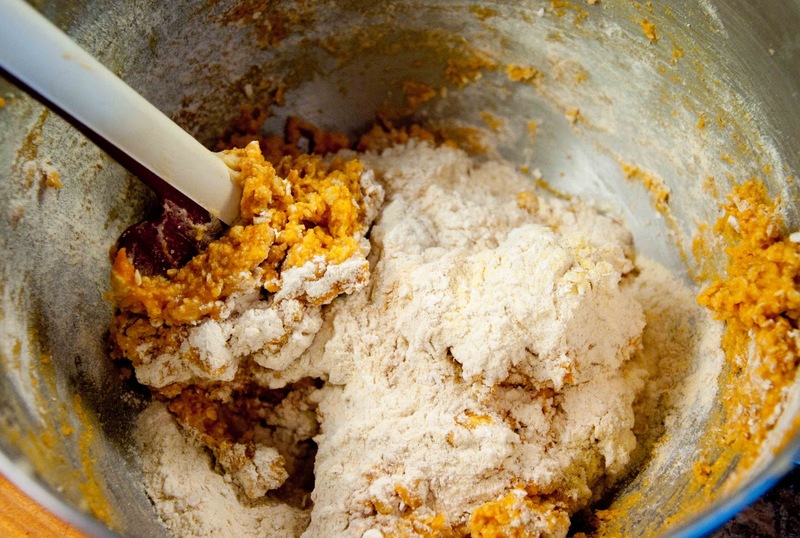 2) In a medium bowl whisk together the flour, oats, cornmeal, baking powder and salt. Add the dry ingredients into the wet mixture in three parts, mix using a wooden spoon or spatula. Do not over mix. 3) In a small bowl, whisk or whip the remaining egg whites until soft peaks form. 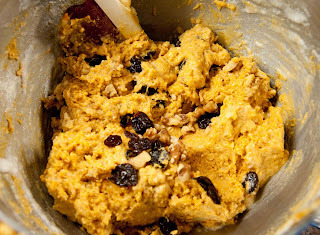 Gently fold in the whites into the pumpkin mixture, along with the cherries and walnuts until just combined. 4) Scrape into the prepared pan, bake until a toothpick comes out clean and the cake pulls away from the sides, about 40-45min. Let cool in pan for 5-10 minutes and then place cake on wire rack to cool. I was expecting this to rise more than it did but I rather enjoyed this. Although a bit denser than I prefer, it was the perfect amount of pumpkin. 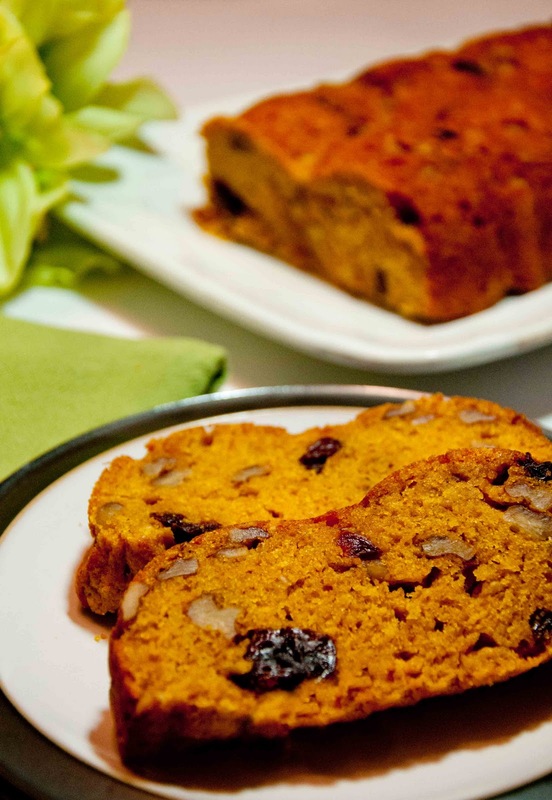 The loaf was moist, with lots of varying textures from the walnuts and cherries, with the cornmeal giving the loaf a cornbread like feeling. The original recipe used orange zest and no cinnamon but I think the cinnamon really brought out a lot of flavour especially with the walnuts. Pumpkin and cinnamon are just a natural pair. I would make this again but maybe I will look to add a healthier spin next time around so I can actually reap the goodness of the pumpkin.